Three flames were utilized by Master Jesus during his lifetime here from the Bridge to Freedom Journal book 2 page 4. “Three great flames I used in my ministry – flames and activities of the Sacred Fire, which were given to me by my teacher which enabled me to control the energies of my world. The first was the Resurrection flame, which quickened the vibratory action of my physical and inner bodies, making each tiny electron, spinning around its own central pole, move more rapidly and throwing off the vibratory action of earth, connected my vibration with that of this ever – Presence, The Mighty I AM Presence. The Second was the flame of Transfiguration, enabling the sacred fire within me to expand more powerfully than the atomic pressure of the outer world. The third flame I used was the great Ascension flame which, surging through my physical, mental, emotional and etheric bodies, carried the energies of my world upward into connection and contact with my own Christ Self (higher self also referred to as our higher mental body) and the Father-Mother God of this universe. Those flames are still in existence. They have grown and intensified in power in the thousands of years since I availed myself of their presence. You beloved ones have opportunity now as you enter this brand new shining year to use the Resurrection, Transfiguration and Ascension flames to make of your energy a harmonious conductor of the gifts and powers of this ever Present One. There is no life outside of yourselves that can maintain the control of your energy, because free will is your gift from the Universal First Cause, but if you choose to maintain and sustain a vibratory action through your feeling world that connects with the Kingdom of Heaven and its inhabitants, at any instant our powers and gifts are yours, and through you, may be conducted into the lives of others." Beloved Seekers after Truth, "I AM" THE LIGHT, THE WAY, THE TRUTH: "I AM" THE FULL POWER OF THE THREE TIMES THREE, come into your midst this day to bring you my feeling of Victorious Accomplishment. Accept it! You have all the momentum of the Cosmic Fount of the Flame of Resurrection at your disposal to draw upon, but like the element of water, which you require for the continuance of your life on this Earth, you will only receive as much from the Source, as you permit the water element to flow through the faucet. True you can keep adding to your 'reservoir' by opening the faucet of your attention from time to time but you, like all other people inhabiting the Planet, do not know how much time has been allotted your lifestream for your sojourn hereon. Think that through! We are offering you all the momentum required for your Freedom NOW! "The “transfiguration” of the physical form follows a scientific law. It merely requires the surrender of the destructive use of one's free-will to the immortal Three-fold Flame of God within the heart. At your conscious call, this flame (intelligent and all-powerful) will expand its light through the four lower bodies and, as the impurities of discord (which have been imposed upon the electrons) are sublimated by the use of the Violet Fire, the pure white light of the electron is then allowed to blaze its light freely, then meeting the blazing light so released from every other electron, the inner and physical bodies just naturally radiate light!" I AM the Resurrection and the Life! 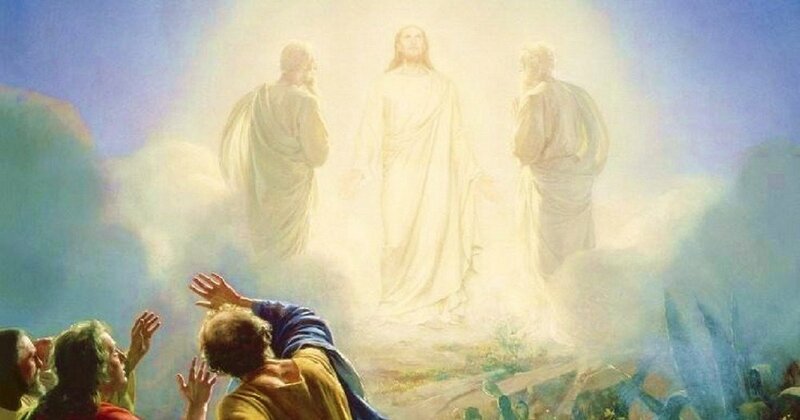 Yes, and I AM also the preceding Transfiguration! Blessed and Beloved Ones Who Love Light As Though You Were Adoring God— How right you are, for God is truly Light, and in him is no darkness at all! Now, I am certain that thoughtful men and women will immediately recognize the difference between the uses of light in Nature and the uses of spiritual light in man. I refer to the fact that in Nature the outline of manifestation is achieved by a little more shading here and a little more light there, thus portraying on the canvas of life scenes of heaven and earth painted in a variety which is out pictured in sunlight and shadow, green leaf and bright marigold, and the marine blue of the deep—white foam and cloud, eternal movement of sky and sea.